One of the top stories in all of college football a year ago was the rise of the UCF football program. From a 0-12 season in 2015 to an undefeated, self-crowned National Championship season in 2017, the Knights flourished in what was an unexpectedly fast turnaround. While former head coach Scott Frost deserves a lot of the credit, his signal-caller in McKenzie Milton is equally deserving of praise. Milton rocketed into fame during the 2017 season, rightfully so. After completing just 57.7 percent of his passes and averaging just 5.9 yards per attempt in 2016, Milton vaulted in Heisman Trophy talks with a ridiculous set of statistics in both standard box-score numbers and our advanced signature statistics. He finished the season with a ridiculous 38 touchdowns and 4,034 yards against just nine interceptions and held the nation’s highest standard passer rating among returning quarterbacks at 123.0. His passer rating of 129.8 on all ‘aimed’ throws was also 37.3 points higher than the college average when removing throw aways, spikes, passes in which he was hit as he threw and passes batted at the line of scrimmage. He was no dink-and-dunk quarterback however as strong accuracy numbers may lead some to believe, as he recorded 37 big-time throws, five more than the next-highest returning quarterback (Drew Lock, 32). Obviously, he was a real threat to test defenses downfield as he also holds the nation’s top returning passer rating on deep throws (20-plus yards) at 131.3. He completed 51-of-91 deep pass attempts for 1,812 and 21 touchdowns, setting the PFF College record for most deep passing yards in a season. Oh, he also fielded an adjusted completion percentage on deep passes of 59.3, the highest of all returning quarterbacks and second-highest in the nation to only Baker Mayfield, the No. 1 overall pick in the 2018 NFL Draft. He wasn’t just heaving up shots and letting a talented supporting cast do their thing, he was maneuvering balls to where only his receivers could bring them in, and doing so with great success. Milton found more than his fair share of wins all over the field however, and was not just limited to chucking the ball downfield. Overall, he averaged 10.2 yards per attempt a season ago, tops among all the nation’s returning quarterbacks with at least 150 pass attempts and 0.6 yards ahead of the next closest quarterbacks, both of whom he had at least 190 more attempts (Justin Herbert, 206 attempts; Jordan Ta’amu, 175). He worked the middle of the field equally as well as he worked passes to the left numbers and saw success at the intermediate level of the field (10-19 yards) as he did on throws behind the line of scrimmage. He was particularly a menace to opposing defenses when he targeted the middle of the field. In total, Milton had a passer rating above the NCAA average in 10 of the 12 bucketed ranges PFF breaks passes down (20-plus yards, 10-19 yards, 0-9 yards, behind the line of scrimmage; left of the hash, down the middle, right of the hash). He also saw positive passer ratings when compared to the NCAA average on 7-of-13 routes, further showing that he can seemingly make all the throws. Milton was strong to all levels of the field, on a bevy of routes but how did he fare on different aspects of pocket play? On average, NCAA quarterbacks saw a dramatic decrease in passer rating when under pressure, and understandably so. PFF determines pressure on a quarterback as any sack, hit or hurry that disrupts the quarterback from his normal throwing mechanics, be it off his spot in the pocket, flushed from the pocket or throwing a hurried pass. By nature, the average quarterback saw a 39.5-point difference in passer rating from a clean pocket to a pressured one. Milton, despite seeing pressure on 138 of his total 437 dropbacks, had a passer rating of 89.2, or 31.5 points above the NCAA average, showcasing that although his passer rating did drop when pressured, it was still well above average. What was even more remarkable, is when given time and a clean pocket, his passer rating of 136.2 was also a stark 39.0 points higher than the average. As good as he was with a clean pocket and when pressured, another tough aspect of quarterback play is diagnosing defensive schemes on any given play, both coverages and blitzes. On 111 dropbacks when Milton was blitzed, he recorded a 127.4 passer rating, completing 67-of-108 passes for 982 yards and 13 touchdowns against one interception displaying a great understanding of his opponents, even against extra rushers. Rounding out his skillset, the rising-junior quarterback from Hawaii also was tremendous with the benefit of a play-action fake, sporting the highest passer rating on play-action throws among returning quarterbacks (147.2). Not shockingly, he sported an equally set of numbers on standard, non-play-action passes, including the national high 9.5 yards per attempt on 205 standard pass attempts. 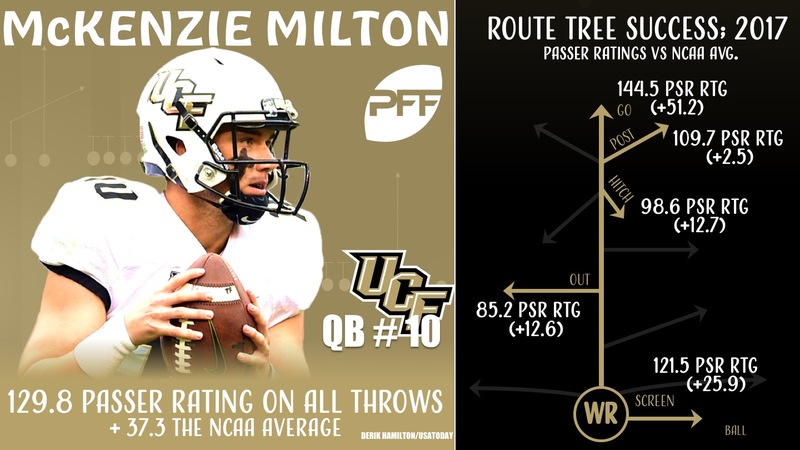 Either way you slice it, no matter which way you look at it – McKenzie Milton’s 2017 season was tremendous. Whether regression is in sight simply because of the gaudy nature in which he vaulted into the national spotlight or because he’ll have to adjust to a new head coach in Josh Heupel, one thing is for sure: Milton has all the talent to be a mainstay atop many of the PFF statistical categories in 2018. He not only returns as the leader in many of the aforementioned categories, he actually battled with Baker Mayfield for the crown among all FBS quarterbacks on the majority of them, showcasing just exactly who he was in the same conversation with all season. Mayfield did the same thing in 2016 and repeated his top performance in 2017 all the way to his Heisman Trophy and first overall selection. Not saying Milton is Mayfield, but if he happens to repeat this level of success he saw last season, there is no doubt he’ll remain in the conversation for the nation’s top signal-caller all year long. He may even wind up bringing a Heisman to Orlando.